Sometimes, you need to look your best. There’s no better way than reaching for a smart suit. 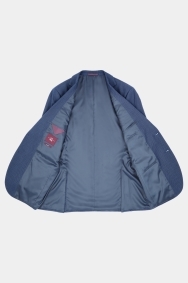 This handsome light blue birdseye jacket from Moss Esq. will stylishly do the job. 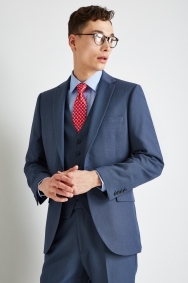 Crafted in a lightweight cloth and in a subtle blue-grey tone, it’s the ideal choice for your formal wardrobe. 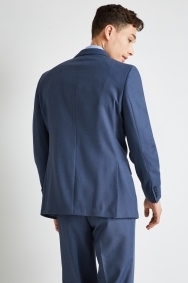 The regular fit serves to give you more room and comfort while creating a sharp outline, and its notch lapel and four-button cuff keep it simple to suit business occasions. 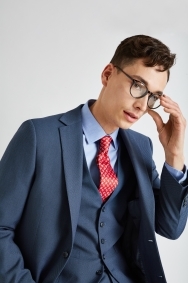 Complement the mid-blue tone of the jacket with a light blue shirt and a red tie. To look your sharpest, team it with the matching trousers and waistcoat, and add a maroon pocket square for a finishing touch. 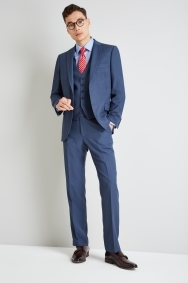 Great quality suit at a amazing price! Jacket fits as expected. Looks smart. Could wear separately if I wanted a casual look. 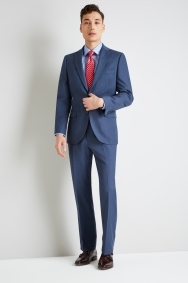 Excellent value for money on the suits which are on sale! Delivery through DHL is reasonably priced as well and very fast. Just a shame that there isn’t a large enough variety on the sale that can fit me. In fact I only found 1 suit where the jacket and trouser size were available for me. If not, would definitely be 5 Star! Very nice jacket, good colour, good fit. There is more of a pattern on it than can be clearly seen in the photos online.